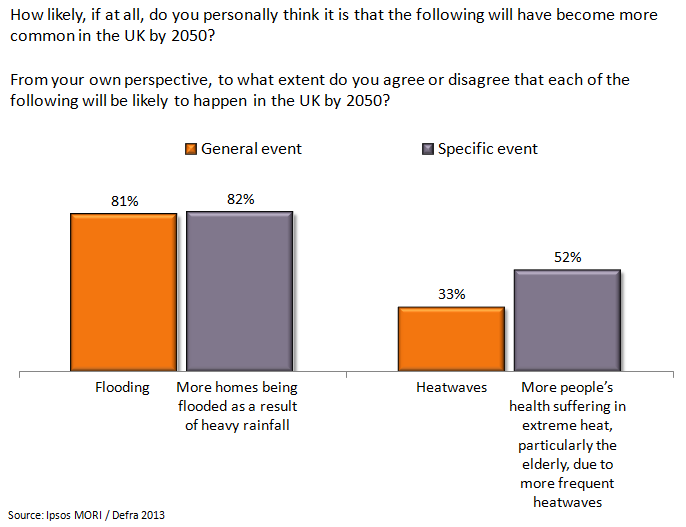 I take two main conclusions from this for campaigns about UK responses to climate change. Firstly, if someone were to start a campaign now about why people in the UK should want action on climate change, the obvious choice would be flooding. People believe it’s already happening, that it’s going to get worse, and that its worsening would be a major problem. 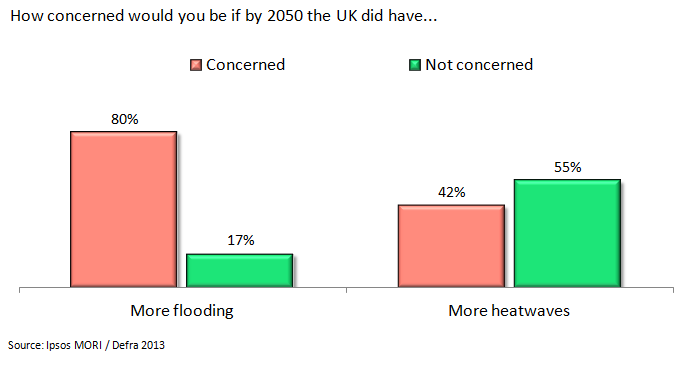 While the poll also shows most people don’t think they personally are at risk from flooding, they’re still concerned and there’s nothing else that has so much legitimacy at the moment. 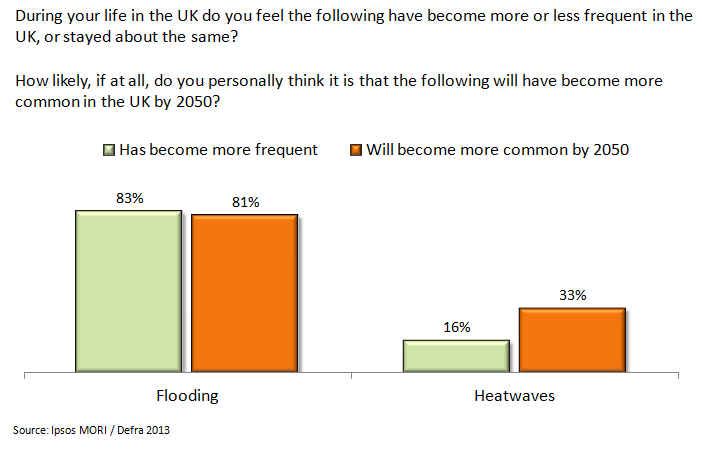 However, this isn’t to say campaigners should forget about heatwaves. Because another question shows that the conjuction fallacy is affecting the results**. The principle of this fallacy is that people often think that a specific condition, described in detail, is more likely than a broader condition, which is not described in detail, but which the specific condition is an example of. Even with this effect, heatwaves are still seen as less likely – but the gap is much smaller, and the following question that tests concern about these specific impacts finds no difference between the described-in-detail floods and heatwaves. So the case may not yet have been won for why people in the UK should really care about tackling climate change, and flooding looks like the strongest ground for developing the argument further, with the potential to be credible and effective. But with some work to demonstrate the connection between the principle and what it means in practice, there’s no reason heatwaves can’t ultimately be part of a campaign as well. * Another factor is that the poll was conducted in the middle of another flood-ridden winter, which probably did swing the numbers a bit – but I doubt enough to explain all the difference. ** I’ve totally read Daniel Kahnemann. This entry was posted on Wednesday, September 11th, 2013 at 22:52	and is filed under Climate Sock. You can follow any responses to this entry through the RSS 2.0 feed. Both comments and pings are currently closed. Why do you think that lying to the public is a good idea? Do you have a clear idea of what you want these scare tactics to achieve? Obviously I don’t think it’s a lie to encourage better knowledge of what are projected to be the main impacts of climate change on the UK. I didn’t just make up those projections; the UK Climate Risk Assessment linked above discusses them, as of course do plenty of other places. If I didn’t think the UK and other places are very likely to be affected by climate change, it would be pretty stupid of me to propose a campaign to tell people about the projections. The purpose of that UK-based campaign would be for better action in the UK on climate change mitigation and adaptation to climate change. I would hardly bother wasting my time doing this if I thought there wasn’t any problem to deal with. Not sure why you think I’m doing it. So clearly you disagree with the conclusions of the various people who’ve projected impacts like increased flooding and heatwaves in the UK. I’m all for debate about the modelling (eg inputs, processes and outputs), how global and regional climate models are translated to local weather systems, and especially (because I don’t think this has yet been done very robustly) how these projected changes to local weather systems are likely to affect people, economies, societies and infrastructure in the future. But I don’t think it’s helpful to the debate just to accuse the other side of lying without offering any more than that. Can you explain why you think this is all a lie? You’ve heard of lying by omission? Not that I’m accusing you, you’re only using what others have consciously, or subconsciously… filtered. Anyone paying attention to weather and health knows that the real killer in the UK is cold. The numbers dying of heat related conditions is miniscule compared to those despatched by slips, cold related illnesses (influenza, norovirus, pneumonia, etc), hypothermia, strokes and heart attacks. Heat problems are easier to solve with affordable energy than the multiple cold related problems. It’s even possible to ‘see’ cold in the death statistics. As for flooding, the MET Office models cannot tell you if rain will increase or decrease. The models had predicted drier summers and wetter winters, which is the exact opposite of what we’ve had recently. While there has been an upturn in rainfall, current levels are not that exceptional when compared to our longest records and flooding is as much a feature of bad planning rules as excess rain. Eg take the block of flats that was washed away in Newburn, Tyneside. They were sitting on a rubble filled, culverted, steep sided valley and the hundred year old culvert had collapsed six months earlier. They were still arguing over whose responsibility it was to fix the drain when the flood happened. Of course it might be hard to persuade the public that climate is going to get scary when we’re not actually warming right now. The UK 5 year running average is dropping like a stone. This year is below average and there are some pointers to suggest that the next decade or so might be colder than we’ve become used to. It damages credibility when anyone tries to blame cold winters on ‘climate change’ because people remember when it was more accurately dubbed ‘global warming’. Now it’s true that not everyone knows the facts about these things but many know enough to suspect when they’re being hustled. The moment you only put the facts that suit your cause you start lying. Yes, I know, both sides do it, but to persuade the public to act in a meaningful way requires something we’ve never seen before. I’m not even sure what it needs but spinning the truth is a bad way to start. Thanks, appreciated the detailed comments. To start, I completely agree about the need to look at relative risks – not only relative to current risks but also relative to other risks. If more people are dying – preventably – from cold-related causes then we should be tackling that. 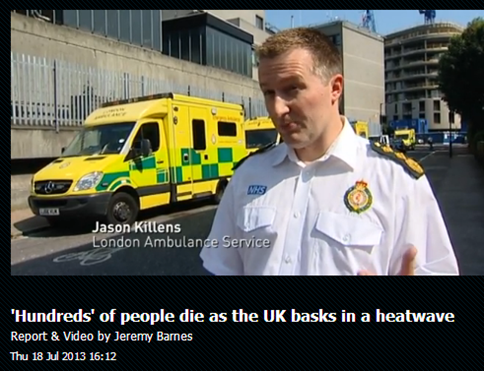 I don’t think the numbers have been run, or at least they haven’t been published, about how morbidity/mortality are likely to change as a result of increased heatwaves in the UK (including falling in winter, perhaps). If they were run and the result was that the numbers of preventable deaths from heat were projected to be much smaller than the numbers from cold, I’d be advocating focusing on cold. As far as I know, but I’m not an expert on this, the calculation hasn’t been done in any serious way, which is worrying. So all we have from the government are general warnings that bad things might happen, without any plan to understand or prevent them. Incidentally, this is all very reminiscent of the deaths from air pollution, especially in London. If we wanted to increase health and lifespan, tackling air pollution is the obvious thing to do. The current projection for rainfall change is indeed for no overall change, but for that rain to be more concentrated in winter and less so in summer, eg http://ukclimateprojections.defra.gov.uk/22168, which would indicate more flooding. As for the Tyneside eg, I completely agree planning is one of the most important issues. A good planning system would be able to deal with most extreme weathers the UK is likely to have in the next few decades. The problem is we don’t have one at the moment! In terms of current temperatures, There’s obviously no sense in picking on individual years/regions (I could throw back at you that July and August 2013 were well above average!) – we both know we’re talking about a complex system with a huge amount of noise that. Clearly the slower surface warning at the moment is a useful reminder that climate change is not something that happens linearly/consistently, with steady increases year-on-year. It’s a trend superimposed on a load of noise. In that context it’s a fair point you make, that if people are led to believe that every years will be warmer than the last, we’ll never see snow again etc, they’re going to feel deceived and spun a line. That’s certainly not what I’m advocating – the complexity and unevenness has to be part of the story. I’ve written several replies to you but not posted them because they hit the wrong tone. We basically agree. You’re making all the right comments about what we have and haven’t got in terms of understanding and solutions. But why isn’t it clear what is the true situation regarding any or all the issues surrounding AGW? It’s not like this is a new issue. We don’t know because there has been a determined effort to make a clear case for cutting CO2. CAGW is considered so urgent that allowing critical voices to be heard, is to dilute the message that we must act immediately. They don’t want the public ‘confused’ by uncertainty or conflict. By predigesting the facts and only serving the public with on message information the scientists and supporters are essentially denying the public the right to choose. Admitting that there are benefits to be had from UK warming is inconvenient when you’re trying to alert people to potential disaster. Like it or not, the inconvenient truth will keep leaking out. Unfortunately if AGW is substantial, it might take decades to become obvious. Plenty of time for the public to become cynical of the message and stop listening. The public could be determinedly deaf at the point they would need to be most receptive and enthusiastic. Currently there is no point pushing the AGW message. The science isn’t clear enough and the solutions we are prepared to use, don’t work. Far better to step back and think afresh at what we need to do and how we could achieve it. The first thing is to admit that the ‘every little helps’ style of cutting CO2 is a distraction. It deludes everyone into thinking that we’re making progress, even while CO2 mounts because of increased population and/or surrounding ourselves with more energy hungry devices. There are only two ways to reduce global CO2. First we need a reliable, copious form of energy that is very low in CO2 or we need to drastically reduce how much energy people use. This first choice is the preserve of a very few, very clever people who might, or might not succeed. Our job would be to have the money and enthusiasm to quickly install the equipment if/when it emerges. We could not do that if we have frittered our money and public good will, on things we know don’t work. To achieve the second option could be possible and would be the responsibility of everyone but it requires a huge change in human psyche. We would need to embrace austerity. We would need to redefine how we achieve success and happiness. We would need new types of jobs and entertainments that don’t result in large amounts of energy or consumption. Such a revolution might be possible but would be extraordinarily difficult. It’s not something that could be rushed in. It certainly couldn’t be spawned by dodgy science and the kind of pressurised selling techniques the consensus bandwagon has been trying so far. It would need to be the reasoned choice of most individuals and the people driving it would have to be the most committed. Let’s not set the stage for a CO2 aristocracy where all people are equal but some are more equal than others. And perhaps, while we mull over how to restructure the whole human race, we may discover it’s not necessary. However the work would not be wasted, we might benefit from such a revolution regardless of the reason for embarking on it. I love hearing debate from both sides, as each contain persuasive elements. Historically, science and politics have had many disagreements. Toss in some religious and business pressure, and anything can evolve (or not). “Only listen to advice which assists the cause”. Anyhow, it always gives me plenty of material for my cartoons. This is my latest . . . .